The pretty climbing flowers climbing on a fence post were part of a garden I saw while in Ogunquit, Maine. I wish I could tell you what kind of flowers they are - somewhat like morning glories, somewhat like petunias, but neither of those. 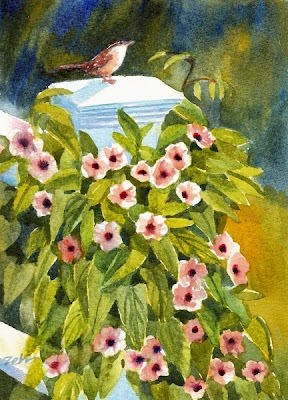 The little wren was inspired by a Carolina wren that flew down to sit on my porch rail while I was out on the porch the other day. It sang and hopped about looking at me all the while and only a couple of feet away. I could have reached out and touched it! Perhaps it was trying to tell me to fill the feeder with its favorite seeds. Not sure, but so cute! I thought it would make a perfect addition to this painting.